Justice Institute of British Columbia (JIBC) is Canada’s leading public safety educator with a mission to develop dynamic justice and public safety professionals through its exceptional applied education, training and research. The JIBC Viewbook provides a broad overview of JIBC’s publicly available programs as well as courses of interest, and profiles of students, faculty and staff. For the full list of JIBC Programs, please visit the Program Search webpage. JIBC offers a broad spectrum of courses in public and community safety. 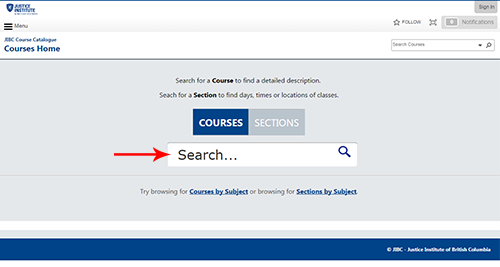 To view the Institute’s extensive list of courses by subject, access our online Course Catalogue. For an overview of JIBC courses by program area, please visit the webpages for JIBC's Schools, Divisions and Centres. Not sure if you have the time to complete a JIBC Program? No problem! Many JIBC courses can be taken independently until you are ready to complete the requirements for a credentialed academic program. JIBC’s Continuing Studies courses are tailored for working professionals and many can be completed in a few days rather than over an entire semester. For a step-by-step guide on how to register for a JIBC Continuing Studies Course, visit the Registration Help page for Prospective Students. To help students attain their academic and employment goals, JIBC welcomes credit transfer from other post-secondary institutions and other organizations where course or program equivalencies have been established. JIBC works toward developing courses and programs that will be accepted by other post-secondary institutions and other organizations for credit transfer or course equivalency. For more information, visit the Transfer Credit webpage. JIBC is committed to meeting the career development and learning needs of its unique and diverse student population. The Institute recognizes that valuable learning often results from work experience or learning outside of the traditional post-secondary system and that valid and reliable prior learning assessment and qualifications recognition can benefit students. JIBC students can apply to obtain Prior Learning Assessment credits that can be applied towards completion of a JIBC Program. For details, visit the Prior Learning Assessment webpage. Number of campuses in B.C.